On Sunday night, something of a political earthquake shook rural Hungary. After Fidesz contested the very tight results of the mayoral election in the working class town of Ózd (population: 36,000), a new vote was held this past weekend. 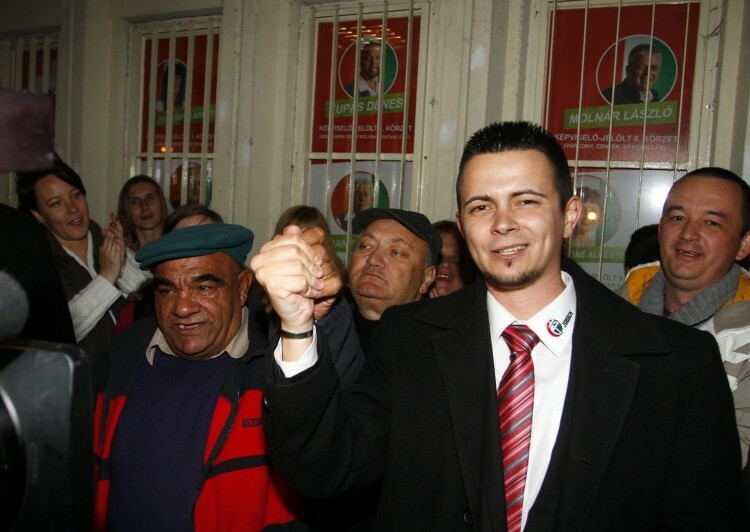 Fidesz pumped all of its energies into winning back this town from the 27 year old Dávid Janiczak, who was Jobbik’s candidate. On the surface, Mr. Janiczak looks like more like an urban hipster, than a politician of a far-right party. All of Fidesz’s efforts were in vain, including its decision to reach out to the city’s large Roma population (estimated at over 11%, according to official statistics from 2011, but probably higher than this), mainly through bribes. Jobbik won two-thirds of the votes in a mayoral election where the turn-out was far above average. Dávid Janiczak celebrates victory with his supporters. Photo: MTI. Jobbik’s candidate garnered 64.4% of the vote. Fidesz’s mayoral candidate and the town’s current mayor won 31%. The joint MSZP-DK candidate, however, was decimated with just 3.2% of the vote. The traditional, prevailing logic that Jobbik performs better with a lower turn-out was called into question Sunday night. More disturbing for the democratic opposition is the fact that it is very clear that MSZP and DK voters decided to support Mr. Janiczak, in order to boot the Fidesz mayor out of office. After all, in the initial mayoral vote (on October 12th), the left’s candidate, Zoltán Veres, won 20.48%. And in the parliamentary elections in April, the joint left-centre candidate garnered just under 30% of the vote. According to István Nyakó, MSZP’s riding president, “local Socialists hate Fidesz so much, that they voted for Jobbik instead.” During a riding association meeting in Ózd, members considered whether they should back the current Fidesz mayor, in order to stop Jobbik, but a majority of local Socialists could not get themselves to do this. Once the ballots were counted, over a thousand Jobbik sympathizers took to the streets of Ózd and chanted anti-Fidesz slogans, including the popular “Orbán takarodj!” (Get lost, Orbán!) refrain. The crowd physically hoisted Mr. Janiczak up and carried him all the way to city Hall. “Today, Ózd won. And tomorrow, our work can begin and together we can show that Ózd is the miracle of miracles”–declared Mr. Janiczak, in a reference to the Wizard of Oz. Dávid Janiczak is carried to city hall. Photo: MTI. “This proud, historic working class city has said enough to Fidesz-KDNP! 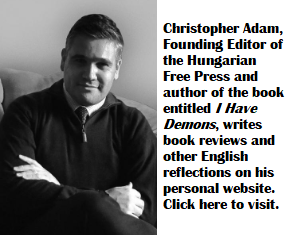 We’ve had enough of how they used the Gypsies against Hungarians, enough of the corruption, enough of the Fidesz fiefdoms”–Mr. Janiczak added. The newly minted mayor accused Fidesz of buying off the local Roma voters by handing out free potatoes and apples, and by driving them en masse to the voting stations. Media reports confirmed that this did, indeed, take place on Sunday. Jobbik has filed a police report against local Fidesz activists. MSZP and DK have some thinking to do, because there is mounting proof that traditionally left-leaning rural voters are moving over to Jobbik in growing numbers. But Prime Minister Viktor Orbán shouldn’t sit back either. While what happened in Ózd does not yet reflect a national trend, it does suggest that the scandals of the recent months (internet tax, the diplomatic row with Washington and the proposal aimed at shutting down businesses on Sundays) is taking a toll on the government’s popularity. Perhaps the big orange wave has been stopped, but — unfortunately — by none other than the fascistic right. We are a small county. We have only one mob.